Social Media Help – Hayden Consulting – Where Your Success in Business and Life Matters! Pinterest and Facebook and Twitter, Oh My! Social Media Sites -There are so many! Facebook, Twitter, LinkedIn, Instagram, Google, Pinterest, Blogs, Online Community News Pages, YouTube and more. Now, you have been told to keep up with the times your office needs to be on these social media sites. Why? These social media platforms help to build your dental practice by reaching your target audience. Build relationships between your office team and potential new patients. But, who will set up all these sites and manage them? I understand that not all business owners (Doctors) can find the time required to start and grow a social media presence. Look at your team , do you have someone in the office right now that is a good candidate to help you do this? One that you can train to be the “voice” of your practice? If not, I happen to love working with social media as a dental marketing source. I’m ready to help your practice grow through the use of Social Media. I can help you set up your social media pages, provide you with engaging and shareable content custom to your office and community that you can easily post to your social media pages or provide you with custom content and I’ll do all of the work of posting to your sites and build relationships with local businesses on their social media pages. Contact me today bhaydenconsulting@gmail.com to set up your Complimentary Consultation. How do I contact you? Would like to find out if we are type of practice that you would like to help? 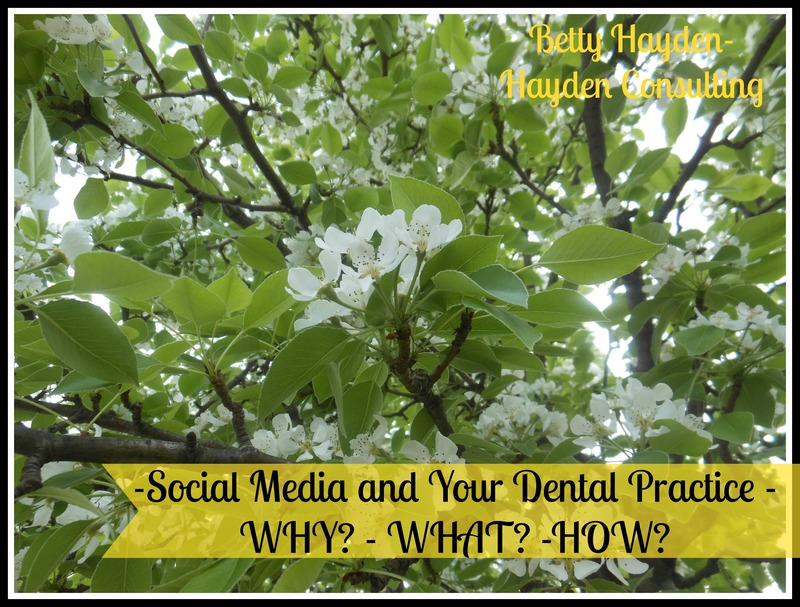 Pingback: Social Media Site Content Ideas for your Dental Office | Hayden Consulting - Where Your Success in Business and Life Matters!